How Much Does It Cost To Fix Home Appliances? A Money Saving Guide – How Much Does It Cost To Fix Home Appliances? Everyone dreads the moment when a large home appliance goes wrong and need fixing or replacing. So, how do you react when this happens in your home? Do you immediately start looking for a new and more modern replacement? Do you try to fix home appliances yourself or should you phone up a trusted repair company? If you have money in the bank, buying a new appliance may be no problem. But for some families, a large repair bill or unexpected purchase could easily make a big hole in an already-tight budget. Cashfloat, a payday loans UK lender, published this guide. Here you will find all the info you need about some of the more common problems which could occur and how to fix them without breaking the bank. An issue with an electrical home appliance may be something as simple as a blown fuse. Alternatively, the problem may be more serious and could even compromise safety for you or your family. The guide will help you to identify the type of problem that has occurred and point you at some of the solutions available. Hints in the guide will also help you to work out the viability of paying for parts and labour. We also talk about whether regular maintenance service is in place or if it is worth considering this type of contract next time you have to replace a large appliance. You will also find advice on how to contact a reputable repair company, make comparisons between quotes for work and servicing and how to ensure that the work is completed with insurance and a guarantee. There is also a section about how to perform a simple DIY repair using information from the Internet. The costs to fix home appliances will vary and will depend upon many factors. These include the accessibility of the appliance, the age of the item, the availability of spares and whether or not you must pay up front or can spread the cost. Many new appliances come with the option of a service guarantee. This guarantee may include all the costs for parts and labour or might just cover the cost of the parts. Some breakdowns might end up expensive, so it is simpler and more economical to replace an appliance. This situation could apply when the technology is outdated, and the cost for parts is very expensive or if the parts are difficult to locate. Replacing a very expensive part could lead you to borrow a short term loan with a high price tag. It therefore can be wiser to replace the appliance instead. The guide will look at essential appliances on your home appliance list. Some different items including basic home appliances like central heating systems, cookers, washing machines, vacuum cleaners, electric fires/heaters and fridge freezers. There will also be information about fixing entertainment systems such as televisions and some simple fixes for lighting including the latest LED systems. Smaller domestic appliances will also be covered detailing information and advice about the problems that could occur with coffee makers, toasters, hair dryers and kettles. It is clear that some people will find it difficult to stump up the money to buy an expensive new appliance. Therefore, it makes sense to look at the costs to fix home appliances which are essential as well as those that make life a little easier or more fun. Safety is one of the most important factors when either an electric or gas appliance goes wrong. One way to ensure the safety of your family is to use only a reliable and reputable repair company. This will also be covered in the guide. Also, there is a list of safety facts about electricity that you can study. These will help to make your home a safer environment. Tips on how to cut down on energy consumption will also allow you to save money in the future. Small adjustments can soon add up to a high saving on energy bills so hints like unplugging a phone charger and making sure that your washer has a full load will help you to save money. One of the ways you can save money is by regular maintenance and cleaning all your appliances. Small jobs like descaling the kettle or ensuring that washing machine filters are regularly cleared out can help your appliances last longer. The guide will give you lots of tips which can help to make sure that your appliances will always work as efficiently as possible. These tips can also contribute to prevent future problems from occurring thereby reducing the chance of more expensive repairs or purchases. The help and advice included in the guide ensures that you have the opportunity to save money both on repairs and replacement of expensive home appliances. But, it is important to stress that you should never undertake a repair that is dangerous. Electricity is a killer so do not touch any device while it is plugged in. 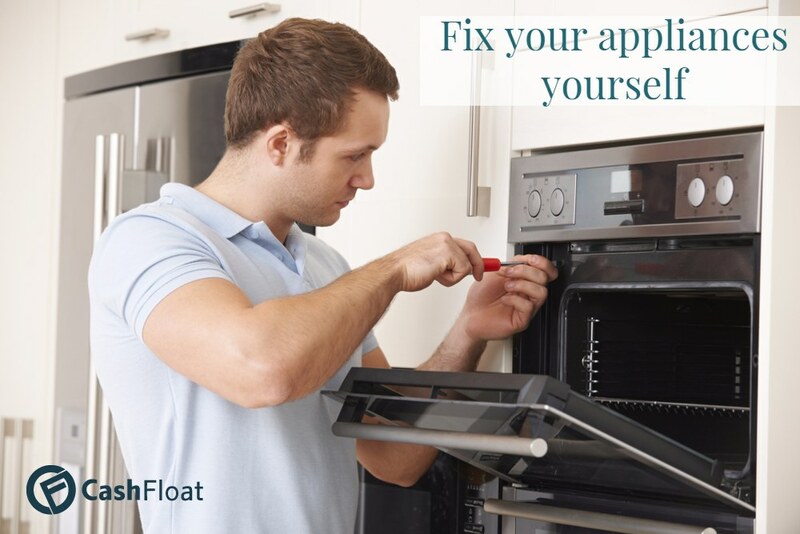 When in doubt it is always better to call for an expert to fix home appliances.